The setting for this project is a 110 hectare sub-division of a wine farm in the Cape Winelands between Somerset West and Stellenbosch, consisting of existing vineyards and some indigenous natural areas largely infested with alien invader species. Small wine farms are generally commercially unsustainable and to this end the client, a pharmaceuticals entrepreneur, wishing to enhance the value of his investment and diversify the land use, has developed a flagship stud farm, training facility, vineyards and olives orchards on land which he recognized as having potential due to its location and natural setting. Conservation of the Cape Floral Region and its associated ecosystems. Provision of a sustained flow of high-quality water to adjoining regions. Together with the architects, OvP developed the site plan, heralding entrance to the farm with an eye catching gateway, flanked by formal row planting of lavender and olive trees with immediate reference to adjoining orchard row planting. 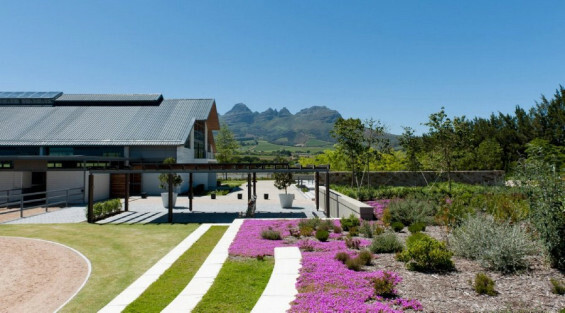 The access driveway through the estate passes the paddocks and is flanked with trees and a stormwater bio-swale and retention pond with associated fynbos planting. The training facility, set deep into the site forms a backdrop to this pastoral scene. The visibility of the paddocks and training facility from the arterial road was enhanced for commercial reasons. 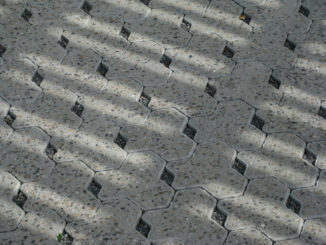 The state of the art training facility and outdoor arena, cut slightly into the rising ground are integrated into the site by means of a series of place making elements, including forecourt and side spaces with subtle changes of level and horizontal planes with trees, space defining walls and formal planting beds. The design intent is of calmness, minimalism and restraint. 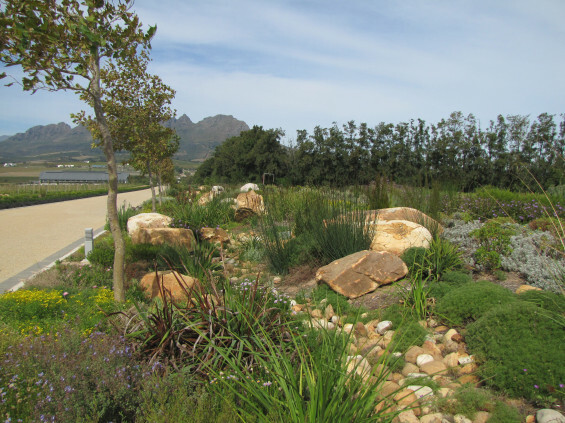 The peripheral planting consists of indigenous fynbos, some of which has been harvested from the existing endemic species pool on site and incorporated into the hydro-seeding of new areas. Formal areas closer to the buildings, for visual effect, consist of carefully selected mixed planting groups, coordinated for colour, texture and variety, providing seasonal year round interest. An indigenous garden links the training facility to the dam and this area now abounds with a diversity of wild flowers attracting various wildlife including guinea fowl, chameleon, waterfowl, butterflies and steenbok. 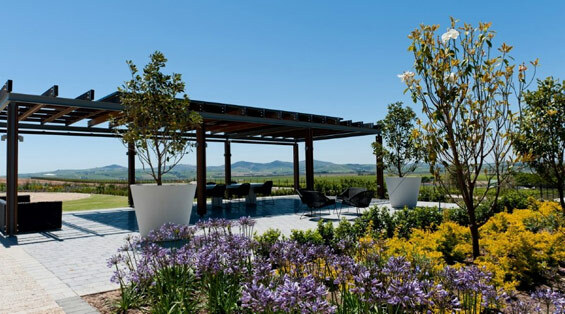 Through managed intervention, Cavalli is contributing substantially towards the Cape Winelands bioshere with the planting of thousands of indigenous plants and the introduction of sustainable farming practices. Phase two consisting of a restaurant and wine tasting facilities is currently in progress.